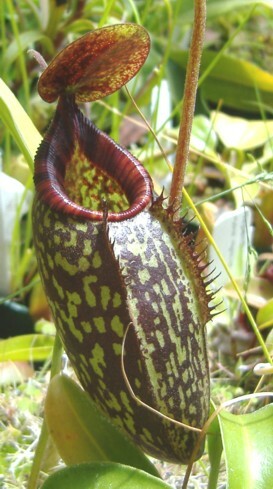 Nepenthes spectabilis X aristolochioides is a hybrid between two highlanders. I have one cutting from Exotica Plants and a few Borneo Exotics tissue culture clones. Hybrids involving N. spectabilis can be quite striking and this hybrid is no exception. 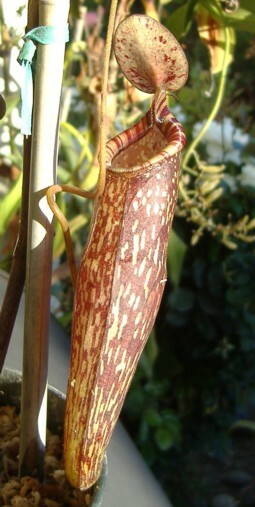 The pitcher shape and coloration has a nice mix from both parents as well as the peristome. So far both variations grow as typical highlanders and seem to tolerate my outdoor environment. The Borneo Exotics clones are doing well for me even in the smaller stage and appear hardy once established. It may be possible to grow this hybrid as an intermediate because N. spectabilis doesn't seem to tolerate lower temperatures like some of my other highlanders and can handle warmer temperatures compared to other highland Nepenthes. The overall stature of this hybrid seems to be that of a smaller scrambling vine similar to that of N. tobaica and N. tentaculata. From what I've seen so far, this hybrid should produce lower and upper pitchers with the upper pitchers being more slender and the lowers having a tubbier appearance. Borneo Exotics has done the reverse cross, N. aristolochioides x spectabilis with N. aristolochioides being the female parent so it will be interesting to see the differences between the two hybrids.